Before learning about good nutrition, I ate so much pizza that I think half my brain is actually mozzarella. Even though I’ve cut back my pizza intake, the average American consumes around 46 slices of pizza each year. That’s almost a slice per week. I’m getting hungry right now just thinking about it. Junk food such as candy, soda, and the other ingredients used in fast food are usually high calories and very low in nutrients such as vitamins, fiber, or healthy fat. Does pizza fall into this category, or can it be a nutritiously sound, complete meal? While pizzas vary from mom-and-pop shops, big fast food-esque chains, and freezer versions you find at the grocery store, they all share similar ingredients. So today we’re going to explore what those ingredients are really doing to your body. Pizza is relatively high in carbs. Exactly how many carbs are we talking about here? One slice of regular crust pizza will only account for roughly 10–15% of your day’s carbs in most cases. Even though low-carb diets are popular for weight loss and certainly help diabetics manage their blood sugar levels, carbs are not the enemy and cutting them out doesn’t automatically make you lose weight. The trick to losing weight it to eat the right amount of calories and macronutrients. 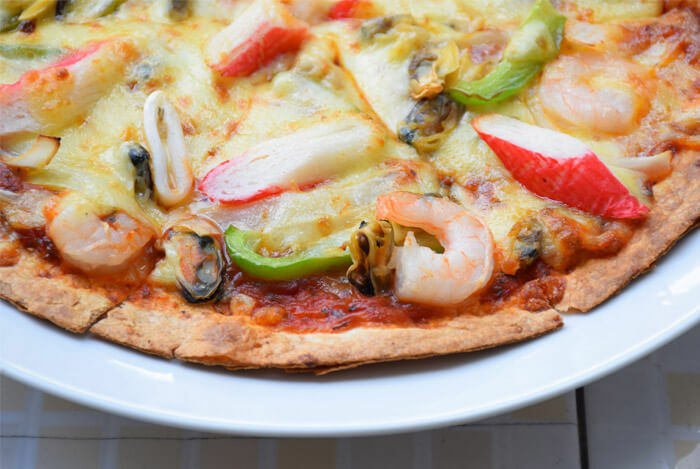 As long as you plan properly, you can fit pizza into your fat loss diet. 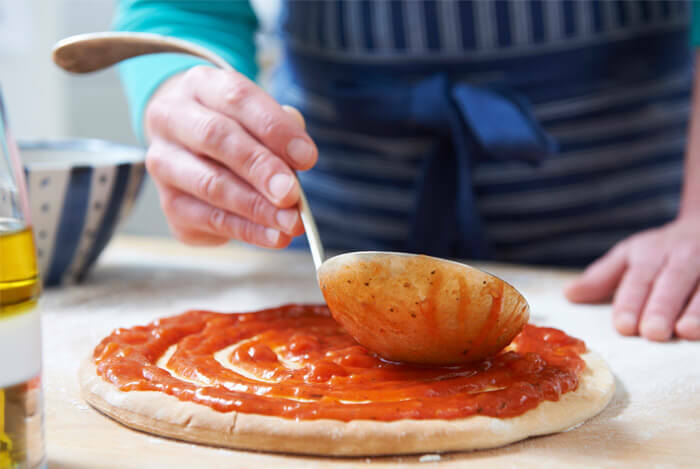 That flavorful layer of tomato sauce is arguably the healthiest ingredient on your pizza. Tomatoes are a rich source of antioxidants such as lycopene, beta-carotene, folate, potassium, vitamin C, flavonoids, and vitamin E.
Now in order to enjoy the benefits of lycopene, you actually have to cook tomatoes or opt for tomato products such as tomato juice, sauce, and paste. Even though one slice of raw tomato contains around 515 micrograms of lycopene, two tablespoons of tomato paste contains 13,800 micrograms of lycopene. That’s a staggering difference! Two studies, one conducted on healthy participants and one studying type 2 diabetics, showed that consuming tomatoes and tomato products decreased levels of LDL, or “bad” cholesterol, and even reduced blood pressure levels. Cheese is a complete protein source so it contains all of your essential amino acids to help your body build muscle, repair tissues, and even supply a bit of energy. A slice of cheese pizza will give you between 12–15 grams of protein. The fats in cheese even slow down the digestion of the carbs and sugars in your pizza crust so they don’t hit your bloodstream as fast. 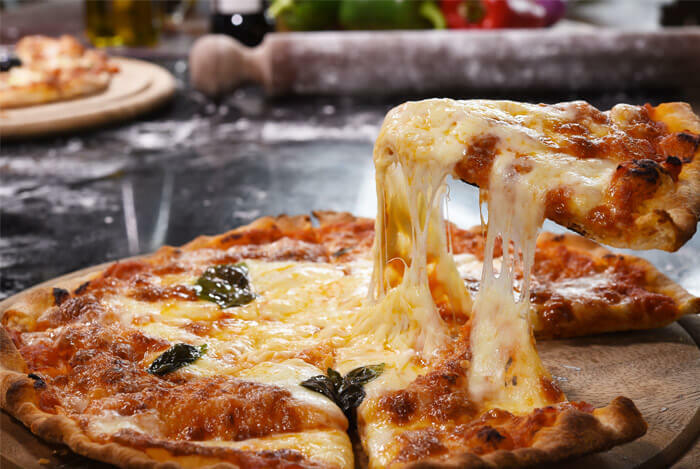 One slice of cheese pizza is 18.5 g of fat, or 28% of your daily value (DV) of fat. Break that down even further and you’ll see that one slice is comprised of 6.5 g saturated fat, making up 33% of your DV of saturated fat. Saturated fat used to be villainized in the nutrition world, but recent studies have shown that “there is no significant evidence for concluding that dietary saturated fat is associated with an increased risk” of coronary heart disease, stroke, and cardiovascular disease. Take the French Paradox for example. French people have a relatively low incidence of coronary heart disease even though their diet is rich in saturated fats. After all, they eat the most cheese per capita of any other country. According to one study, participants with the highest full-fat dairy consumption (median intake 339 g/day) had fewer deaths due to cardiovascular disease than those with the lowest intakes. Just make sure you plan ahead and ensure that your choices fit into your daily calorie and macronutrient intake. We’ve talked about all the parts of the pizza, but what about the whole pie? Is it healthy or the worst food choice you can make? I say it all the time: moderation is the key to good health. Can you indulge in a slice of pizza every so often? Sure. What’s your take on pizza? Have anything else you’d like to share? Let me know in the comments below!